Back in 2012, in the few weeks preceding Maker Faire Bay Area, I was excited about a new secret project. We had the macetech LED Lounge again, but this was a way to take the party with you. 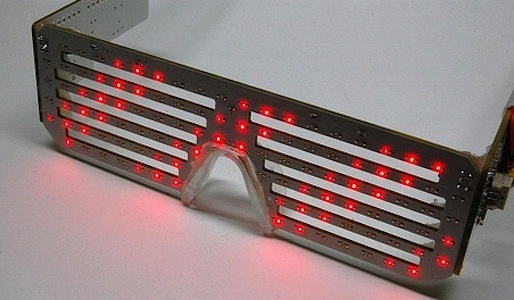 Wearable LED slotted shades with a built-in Arduino-compatible controller! They were a huge hit, both at Maker Faire Bay Area and Maker Faire New York. It was impossible to walk down the street in Manhattan without getting comments and questions every few seconds. 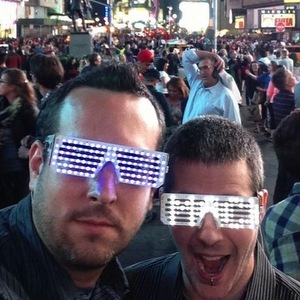 However, the first LED Shades were nothing more than prototypes. They were hurriedly designed. Didn't have much resolution, didn't have folding hinges or cables with connectors, the battery was taped onto the side, and so on. The biggest problem was one that didn't show up for months, but claimed all but one of our prototypes (which still works to this day). The problem was that the LED driver ICs along the top edge of the PCB would crack internally due to flexing stress while being worn. This led us to develop the new LED Shades (available now at a deep discount), which used much smaller driver ICs, relocated them to a stiffer part of the PCB, enhanced the resolution and brightness control, added hinges and flexible cables, etc. The new design has had its own share of problems, but due to outside influences (stock levels, manufacturer capabilities) instead. The first design does have a lot of appeal, though. As opposed to the new design, which requires a 4 layer PCB, the first design worked on a simple 2 layer PCB. Control was very simple through a set of shift registers, whereas the new design uses driver ICs with a very complex I2C protocol. And the first design was much easier to build in a home electronics lab, while the new design uses BGA chips and requires careful solder stencil and reflow work. Still, we're probably not going to continue developing this design. I think a lot of the problems can be solved, but we have other designs to improve first. So we've decided to put the design files out there under an OSHW-compatible license, for anyone to examine, modify, try out, whatever. The design uses this battery from Sparkfun: https://www.sparkfun.com/products/10718. However, other similar batteries could be used by leaving off the JST connector and just soldering the wires in place. The board uses the FT230X USB-serial converter and as such requires up-to-date drivers from FTDI. And in the Arduino environment, the board should be selected as the Arduino Pro Mini with ATmega328 running at 8MHz on 3.3V. If you use the TI part rather than the Allegro part...we found the Allegro part to be a little less troublesome. Also note that the TI pinout is rotated 90 degrees from the Allegro pinout! It'll work, you just have to turn the chip to match. However, I'd recommend not using these parts without reinforcing the top part of the shades to prevent flexing. If you find this design useful, please let us know! We'd be happy to post any success stories, either from improved versions of this design, or just something you borrowed from it. And of course, if you just want to skip to the part where you have cool Arduino-compatible LED Matrix Shades right now...we've got you covered: LED Matrix Shades in the macetech store. Submitted by Garrett on Wed, 07/02/2014 - 23:12.